Imagine battling Darth Vader and having his light saber break open and spray candy every where! Epic! And the kids totally loved it. It blew their little minds! The trick is to make the light saber strong enough to stand up to some abuse, but also with a weak spot so that the pinata would eventually break open. 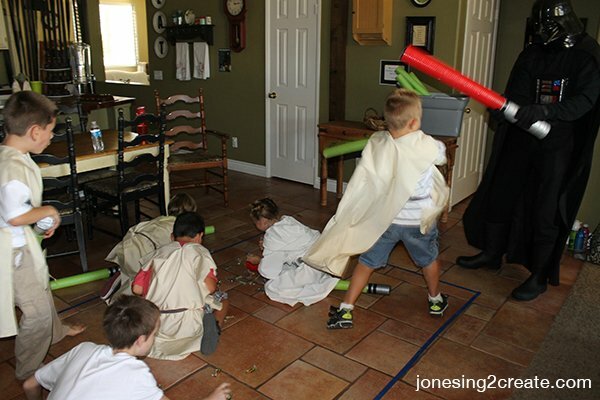 We planned to have the kids start out battling with their foam light sabers and then I covered a plastic bat to look like a light saber so that we could pull that out in case the light saber pinata didn’t break open. I thought it was going to be impossibly tricky to make, but it actually ended up being the easiest pinata I have ever made. Drainage pipe is just the right size to fill with candy without being too big. The connectors for it are also perfect for the hilt. So I started out with a long piece of pipe, then a connector, and then a very short piece of pipe, and another connector. To plug up the bottom of the light saber, I grabbed a sour cream container, put some glue around it and placed it up inside. 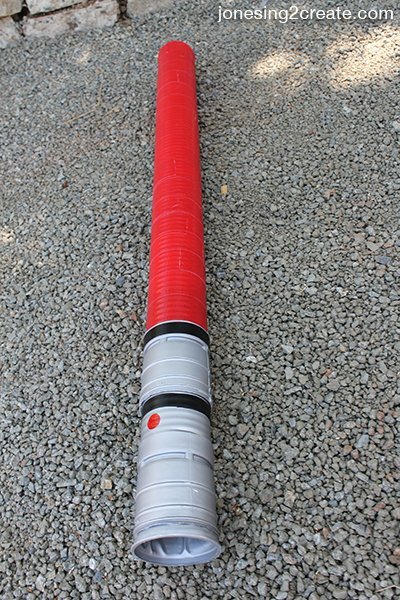 You will also want to save a small section of pipe that is about 8 inches long for the top. We were redoing the backyard at the same time I was planning the party, so our wonderful concrete contractor gave me some of his spare pipe! Next you will want to spray paint the hilt silver. 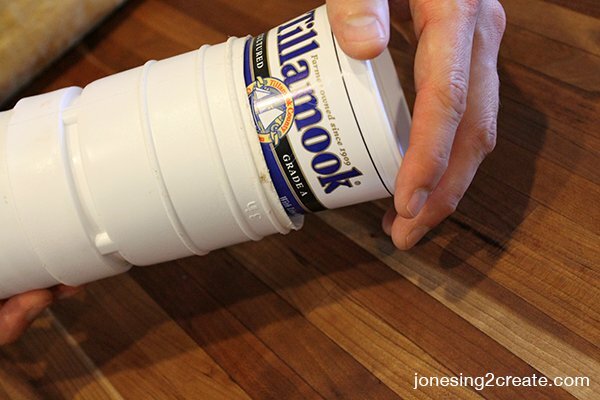 Be sure to also get up inside the sour cream container. To get the light saber to break open, you will need a weak spot. So I taped the top 8 inches of the pipe onto the larger piece using masking tape. I used four pieces on four of the sides, but that made it too easy to break. Unfortunately one of the boys accidentally hit the light saber with his arm and it broke it open before everybody got a turn. I would recommend trying eight or more instead. Don’t worry about the masking tape showing, because you will be covering it will duct tape later. When my hubby was Darth Vader he knew where the weak spot was so that he could either avoid having them hit it or he would break it open against the ground if he needed to. To get the two pieces to fit together right, you will want to make sure the cut is pretty level and straight. I bought individually wrapped Sour Patch Kids to fill the pinata with. We decided on these because we knew that they wouldn’t rattle around and make a lot of noise inside the light saber. We didn’t want the kids to notice that something was up. Also, if they came spraying out they wouldn’t hurt if you got hit with one. A large box was just the right size to fill the light saber. 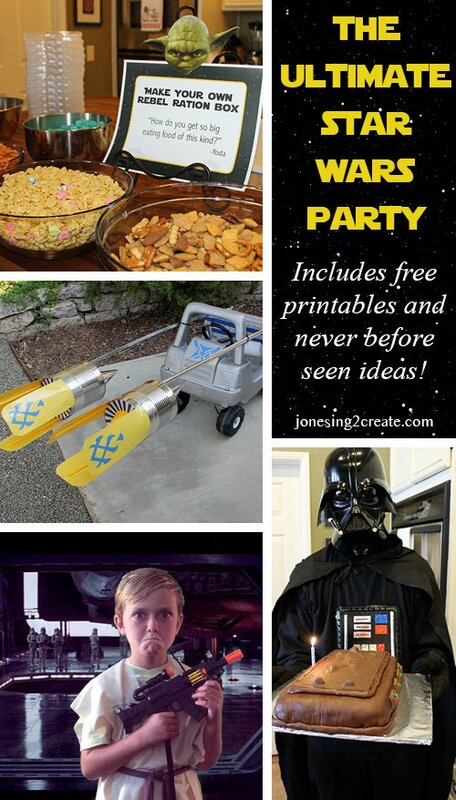 Or if you want to be “punny” you can fill the light saber with lifesaver candies! First you will need to seal off the top of the light saber with red duct tape. 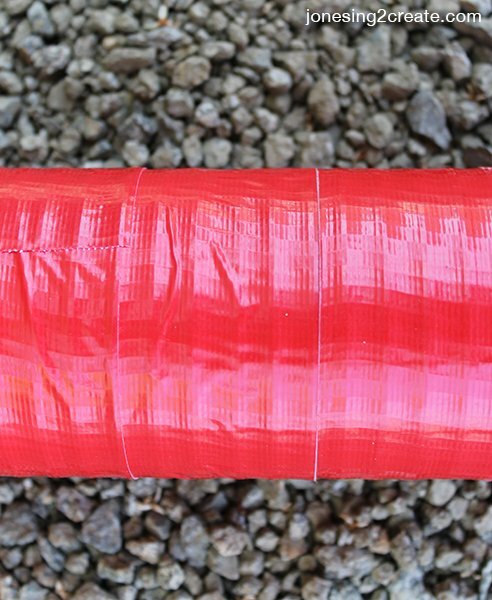 Then cut off lengths of red duct tape that are just long enough to go around the pipe. Cover the entire pipe with the tape. When you get to the seam between the two sections, be sure not to cover the area with duct tape. Instead, position the duct tape just enough to barely cover the seam. If you tape the two sides together with duct tape, it will be hard to break it open. If you look at the image below, you will notice that you can just barely see the seam. I used a red circle sticker for the button on the hilt and added some more detail with electrical tape. For the bat, I covered it with silver and red duct tape. I covered the bottom part of the bat with a toilet paper roll first so that the bat didn’t taper off at the end as much. It took me all of 10 minutes and it looked awesome. Once all the kids get a chance to fight Vader with their foam light saber, pull this baby out if the light saber hasn’t broken open. Hi, do you still retain any picture for step 3? I don’t quite understand especially on sticking the 8 inches part. Appreciate your reply. Thank you. Sorry, I don’t have a photo. I really should have gotten one 🙁 Basically, the light saber is made of two pieces of pipe – the larger lower piece and the top 8-inch piece that is supposed to break off. To connect the two pieces, I used masking tape so that the seam was weak enough to break apart when hit. Does that help a little? Thanks! Hi, I just read your reply. Thanks. Because I saw your light saber is longer than 8inches, that’s why I wonder what’s the top part above the 8 inch. I think I got it, toilet paper roll for the bat. 😉 thank you so much. Grabbing my pipe soon.